The Toyota Mark II is a model name used by Toyota for several decades. The first series, called the Toyota Corona Mark II was an all new vehicle at its introduction in 1968, that sought to offer a car that was just under Japanese government regulations concerning maximum vehicle dimensions and engine displacement. Using the established platform of the Toyota Corona sedan but slightly larger and wider, it was exclusive to Toyopet Store locations, and offered as a competitor to the newly introduced Nissan Laurel in Japan, and the Nissan Bluebird/Datsun 510 internationally that appeared August 1967, and two years after the Mazda Luce in 1966. Toyota was known at the time as a small, economy car manufacturer and the Mark II allowed Toyota to establish itself as a more mainstream, international automaker. The Mark II introduced the world to a comfortable front engine, rear drive vehicle that was larger than older Toyotas while maintaining an affordable price and better fuel economy than vehicles with larger straight 6 and V8 engines. As the Mark II began to become popular with drivers around the world, Toyota introduced variations of the Mark II with two different model names, both sedans but with different styling and marketing approaches. The sportier Toyota Chaser appeared in 1977, and later in 1980, the high luxury content Toyota Cresta appeared, and both were exclusive together at Toyota Auto Store locations. 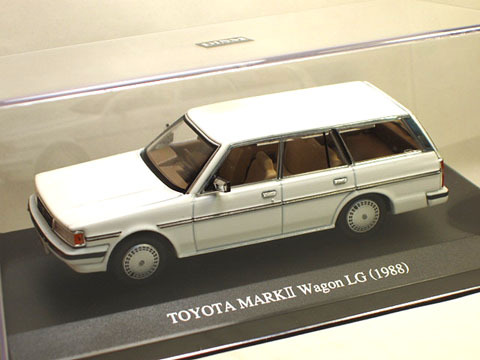 As other Japanese and international automakers continued to offer vehicles in this size class, the Mark II’s popularity peaked in the 1980s. The Mark II was available with engines ranging from a 1.8-liter straight-4 cylinder to a turbocharged 2.5-liter that pushed the 280 horsepower (209 kW; 284 PS) self-imposed limit of the Japanese auto industry.